Andrew Fenner substituted for Cleaver on at least two The Organ, The Dance Band, And Me recordings. One track is “Too Many Irons In The Fire”. Spent around 30 minutes in trying to find these playlists and this feedback point. Are we forgiven for not posting here any earlier? 😉 Might we suggest that playlists and feedback comments [from subscribers only, perhaps] could be made available the website Home page? This would be an easy and effective ‘carrot’ to dangle before prospective subscribers. Thanks for this Show. It’s a refreshing change to hear organs being used as an accompaniment or foundation to other instruments and vocalists. It’s not our first choice of format, but nonetheless still very interesting, and it gives a fuller picture of how pipe organs have been used through the ages. It’s always worth remembering that both church and concert organs have been used for centuries in conjunction with singers, and that pipe organs are sometimes used as a part of an orchestra in classical music. Some street organ performers, mainly in continental Europe and in South America, also use additional instruments to complement the pipe organ. Then there is David Wasson, in the USA, who built his own automatic pipe organ – called ‘Trudy’ – over a 28 year period, and some of his Youtube videos feature instrumental accompaniment. So why not use theatre/cinema organs in the same ways with jazz and other popular music? A suggestion comes to mind here, Stephen: How about including, in a future Show, one or two tracks of Photo Player performances, where a ‘piano roll’ works the organ, and the performer adds numerous ‘toy box’ effects? Those instruments preceded cinema organs in accompaniment to silent movies, and a few are still in good, playable condition. Steve, it is refreshing to hear the theatre organ being used as a part of musical ensemble. 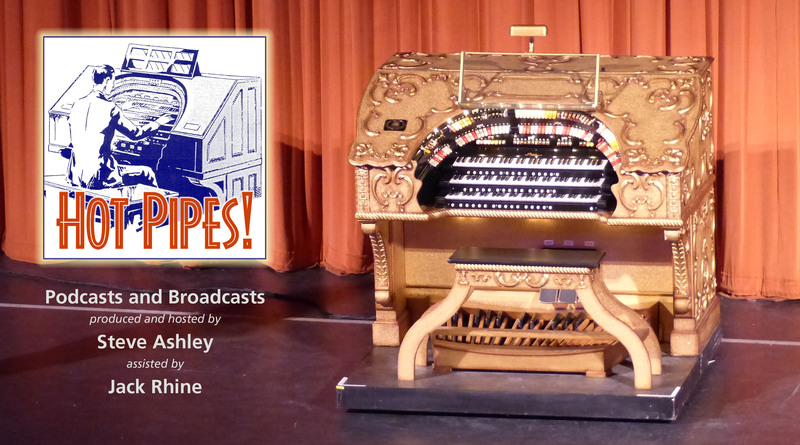 I look forward to another Theatre Organ Plus – either as a full program or a track or two added into more regular programs. Richard: Thanks for your comments – as always constructive! On your first point – a very good idea to include the latest comments on the Homepage. I will try to include this feature when I redesign the website, hopefully in the next month or so before I go to the States for the ATOS Convention. As to your second point about Photo-Player tracks, unfortunately, I have no recordings in my library!